It's National Sticky Bun Day, that is celebrated annually on February 21. Today you can enjoy your favorite sticky buns for breakfast. It is believed that sticky buns originated in Germany and the German settlers brought their recipe to America in the 18th century. This treat became very popular first in Pennsylvania, than across America and changed its name from schnecken (as they were called in German) to sticky buns. Sticky buns are almost like cinnamon rolls and are made with the same ingredients. The thin pieces of leavened dough is rolled with love and then filled with cinnamon and brown sugar. The difference is only in the process of baking. Don't forget to line the baking pan with maple syrup, brown sugar or honey before you place the rolls of dough with cinnamon filling on top. Once the buns are baked, turn them upside down and the sticky sweet goodness underneath the buns will turn into an irresistible topping. 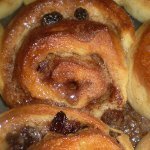 Sticky buns are great with a steaming hot cup of coffee, so bake them to share with your friends or family and celebrate National Sticky Bun Day.